Japanese Episode 240: "Magukarugo! Atsui Kokoro de GETTO da ze!!" English Episode 531: "Some Like it Hot!" Continuing his journey to Fusube City, Satoshi and his friends are forced to cross through a hot and humid volcanic road riddled with hot springs and Magcargo. One of the larger Magcargo has decided to take a nap in the middle of the road, blocking the only way out! After being awakened, the Magcargo attacks Satoshi-tachi, prompting Kasumi and her water pokemon to retaliate. Just then, a young boy named Yakeishi appears and laughs at Kasumi's fighting style. 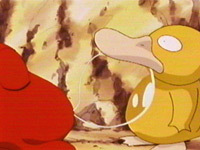 The two argue over which is better, water-types or fire-types, and their bickering enables the Magcargo to get away. Yakeishi berates Kasumi for screwing up his chance of getting a Magcargo, but Satoshi is just happy that the pokemon is out of the way. Yakeishi sticks around for a while and eventually settles his differences with Kasumi, so the water pokemon trainer decides to help Yakeishi capture the Magcargo. Yakeishi finds and catches Magcargo, but as soon as the pokemon's captured it's taken away by the Rocket-Dan. Kasumi and Yakeishi, working together, defeat Musashi-tachi and retrieve Yakeishi's new pokemon. Satoshi-tachi part ways with the young trainer and continues toward their next adventure. Meh, more filler, but complaining about it won't do any good. It's best just to ride out episodes like this one until the good ones start, which is pretty soon actually. Not that this episode was all that bad, though. The battle between Yakeishi's Booster and that Magcargo was pretty interesting, even if it would never work like that in the games. And the Rocket-Dan's motto was pretty interestingly animated. But there are still some things that just bugs me. First of all, what's the deal with Yakeishi? He just kinda shows up with no explanation whatsoever, and we're just supposed to accept that. They could have at least told us that he's a pokemon trainer or that he lives nearby or something instead of making him one of those random characters who we'll never see again. Secondly, the power of Nyorozo's Water Gun is inconsistent throughout the episode. Earlier, it's not strong enough to penetrate Magcargo's shell, but later it uses that same attack to break through the metal arm the Rocket-Dan used to catch Yakeishi's Monster Ball!? I just don't get it. Magcargo doesn't keep its Japanese voice despite the fact that it has the same name in the dub as it does in the Japanese version. I guess 4Kids had some extra time on their hands or something, so they got someone to go in and dub this pokemon's voice. In the Japanese version, Yakeishi refers to himself as the Fire King while Kasumi calls herself the Water Queen. In the dub, they downgrade both of their statuses to "The Prince of Fire" (for Egan) and "The Water Princess" (for Misty). I dont' have a clue as to why 4Kids would change that. Ginga ga moeru Roketto-Dan no futari niwa! We keep cool while you get a molten rock bath. Hit it out of the park, wouldn't that be a switch. Wiinding up we prepare for a homerun! Keep your eye on the ball, here comes a hard one! I thought this was softball! !